I always avoided commercial breakfast bars as they usually have a lot of hidden sugars and other unnecessary ingredients in them, even the ones with the word “healthy” or a picture of a slim female figure on them. Again, homemade is better. 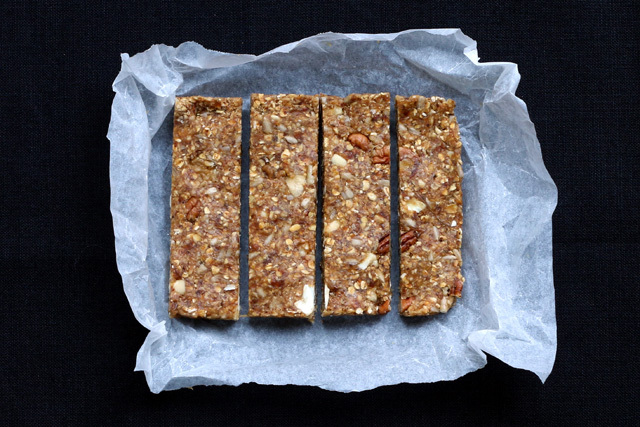 These easy-to-make breakfast bars make an energy-boosting breakfast, but they work equally well as an afternoon snack. Did I mention that they taste gorgeous? Well they do! Soak the dates for 30 minutes and while waiting, heat the oven to 175c and toast the oats in the oven on a parchment covered baking tray for about 10-15 minutes. Sprinkle some vanilla powder & cinnamon on the oats once they are out of the oven. Turn off the oven, mix the honey & peanut butter in an oven proof bowl and let them melt in the remaining heat in the oven while you prepare the dates. Process the dates into a paste using a food processor (I used my Jazzmax juicer for this). Mix all ingredients in a large bowl using a fork. The paste might seem very dry at first, but keep pressing and mixing it with the fork and eventually it will start to come together, forming a sticky hard paste. Line a square dish (or a big lunch box) with parchment and press the paste firmly into the dish. Place in the freezer for 20 minutes and then take out to cut into bars. You can store the bars in the freezer for a couple of weeks or leave at room temperate and eat within three days. This recipe makes 10 bars. I like that this recipe uses totally normal real foods- it makes a granola bar you can feel good about! I’d love for you to share a post at my link up tomorrow, if you’re interested!